Spring bulbs, Azaleas, Rhododendrons Walled gardens, herbaceous border, roses Exotic trees & shrubs, autumn tints. Spring Plant Fair, Garden Festival, Chilli Festival, Autumn Plant Fair see website for details. Double herbaceous border reputed to be oldest in England. Award-winning gardens created by generations of the same family. Hall re-built in Jacobean-Victorian style in 1840's is a beautiful family home, used for filming weddings and corporate events. Knutsford Gt. Budworth, (old estate village). Overlooking a beautiful park, these award-winning gardens have been lovingly created by successive generations of the same family. Features include the double herbaceous border, first laid out in 1846, the pleached lime avenue, the unique avenue of Quercus Ilex, shaped like giant cylinders, fine yew hedges and topiary. The gardens also contain a good collection of shrub roses, rhododendrons and azaleas, walled gardens and a herb garden. The Grove is a more informal area of the garden and contains spring bulbs, a large collection of rhododendrons and azaleas and other flowering shrubs and trees. The gardens and house have recently featured in the ITV production of The Forsyte Saga. The earliest records of the gardens at Arley appear on a map of 1744. When Sir Peter and Lady Elizabeth Warburton lived here in 1743 they built the first walled gardens and laid out a large pleasure ground of shrubberies and walks on the east side of the house. 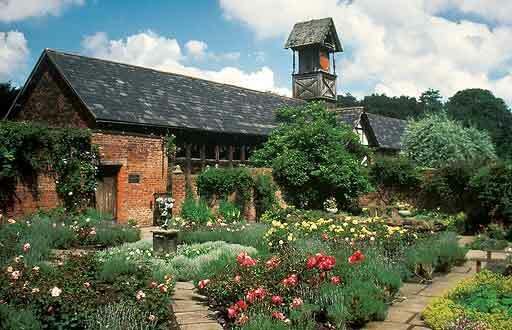 In 1846 Rowland and Mary Egerton-Warburton created the garden which we see today. The breath-taking double herbaceous border was laid out in that year, many years before William Robinson made herbaceous borders so popular. George Elgood painted the border in 1889 and his watercolours were reproduced in Gertrude Jekyll's book Some English Gardens, published in 1904. They also created the Rootree, an area of stumps and rocks, again popular in the Victorian period, the Furlong Walk and Tea Cottage garden (so named for the tea parties held there). It was his love of trees that encouraged him to create the Pleached Lime Avenue and other avenues on the estate. In 1900 Antoinette Egetton -Warburton, Rowland's daughter-in-law, created the Flag Garden as an enclosed sanctum featuring roses, lavender and other fragrant plants. In 1930 the Fish Garden with a small central pond, was created, taking the place of a former bowling green.